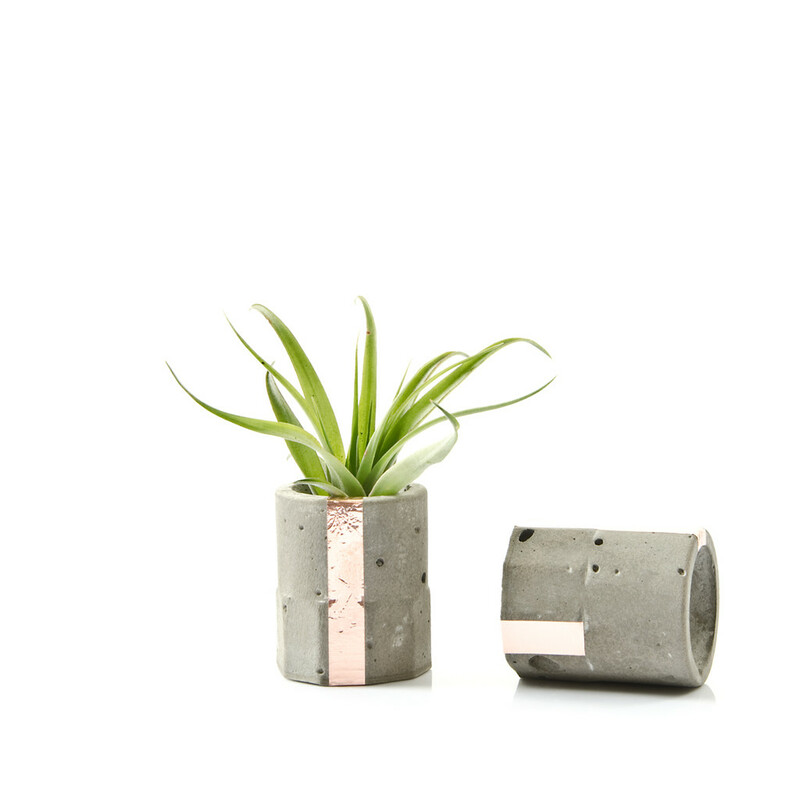 A charming concrete and copper mini Air Plant holder. This small cutie could be the start to a concrete planter collection or the perfect addition on your desk or planter-shelves. 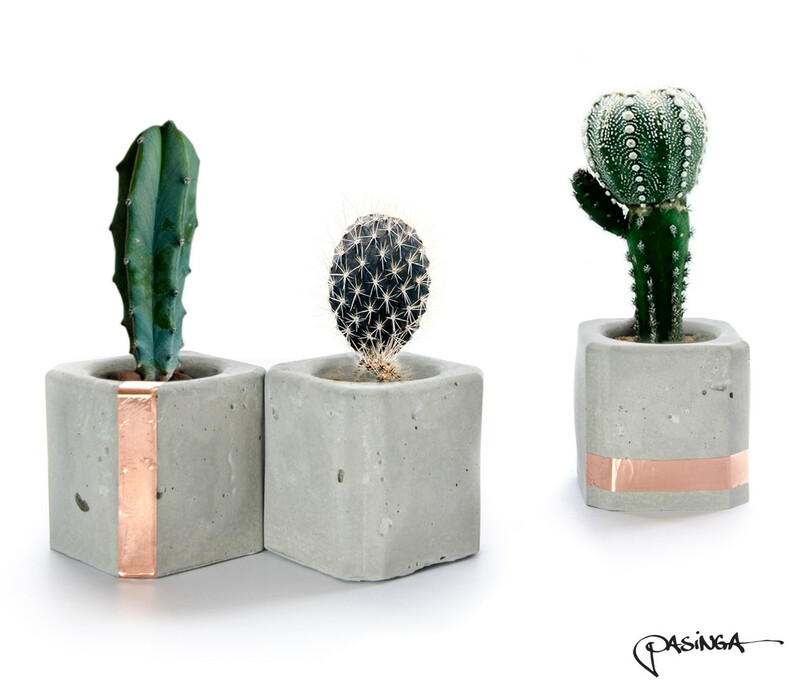 Each is unique, not just because it's individually crafted but because of its raw texture and the shade of grey which varies from vase to vase. 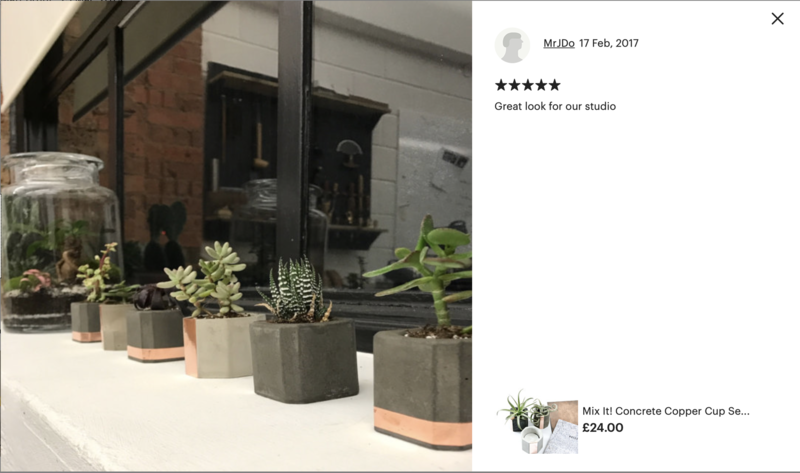 It's small to fit any space, it could be the perfect detail between your collection, a gift for him or her or a beautiful desk accessory. psst ... more designs are below, enjoy! 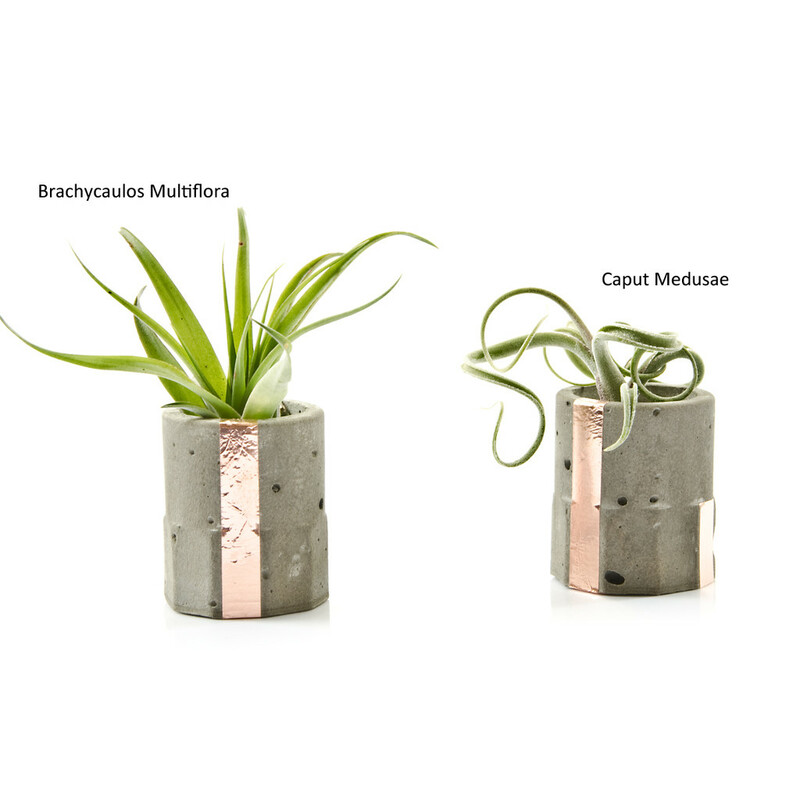 Caput Medusae: is a beauty, thick channelled leaves in light green to blue purple with this wonderful icy charm of grey hairs. 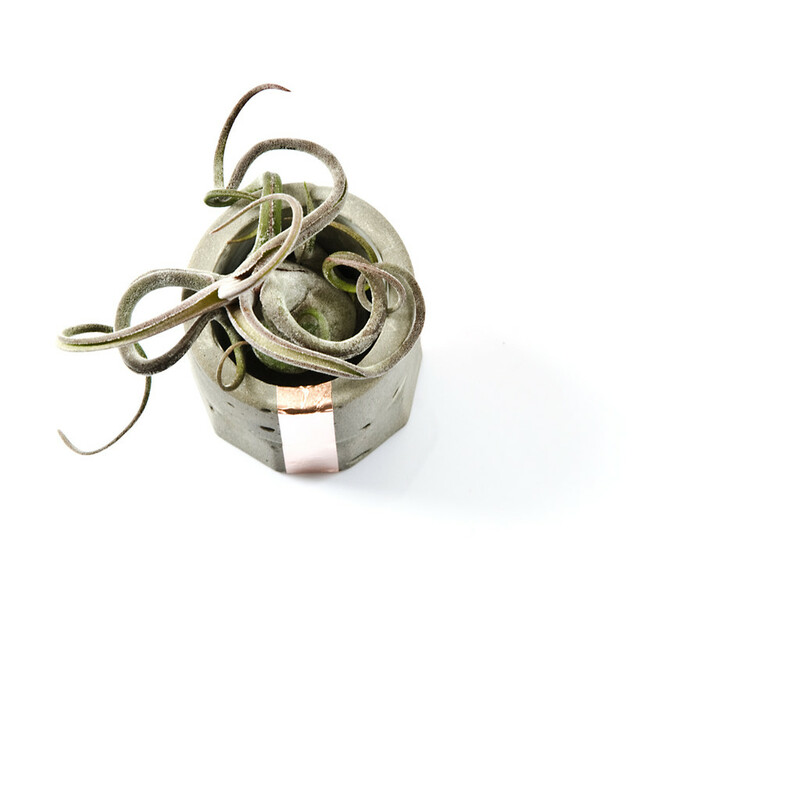 Once placed in its concrete planter the spectacular snake like winding and curling starts which creates a beautiful sight. It is one of the most widespread, hardy species. Brachycaulos Multiflora: is a medium to large plant which can grow up to 20cm high, but its size varies greatly. 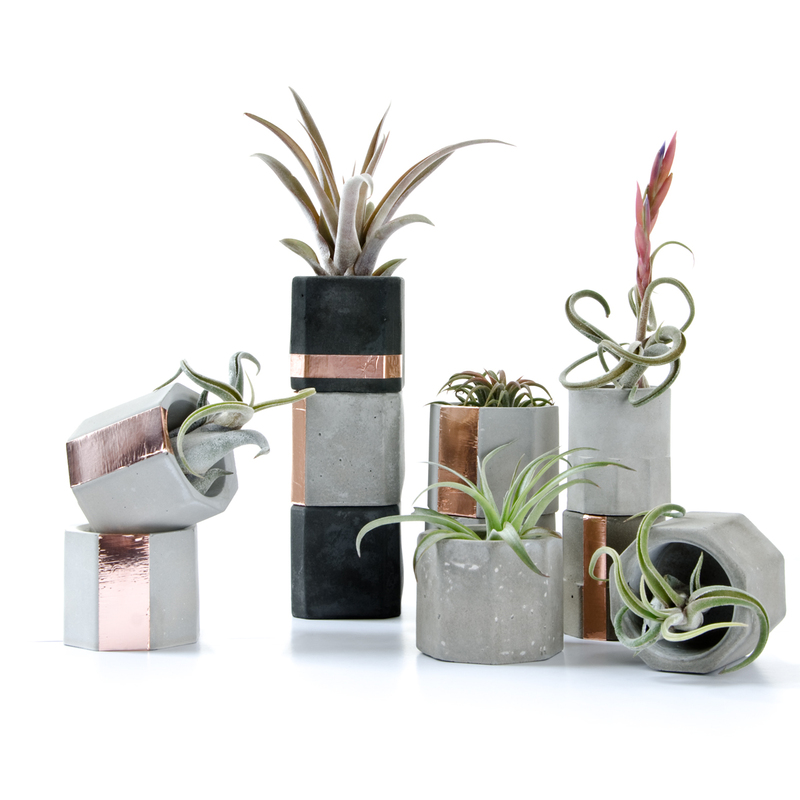 The foliage is numerous, as it grows it opens up with leaves bending slightly. The leaves are green but colouring intensively red in strong sun at bloom time. 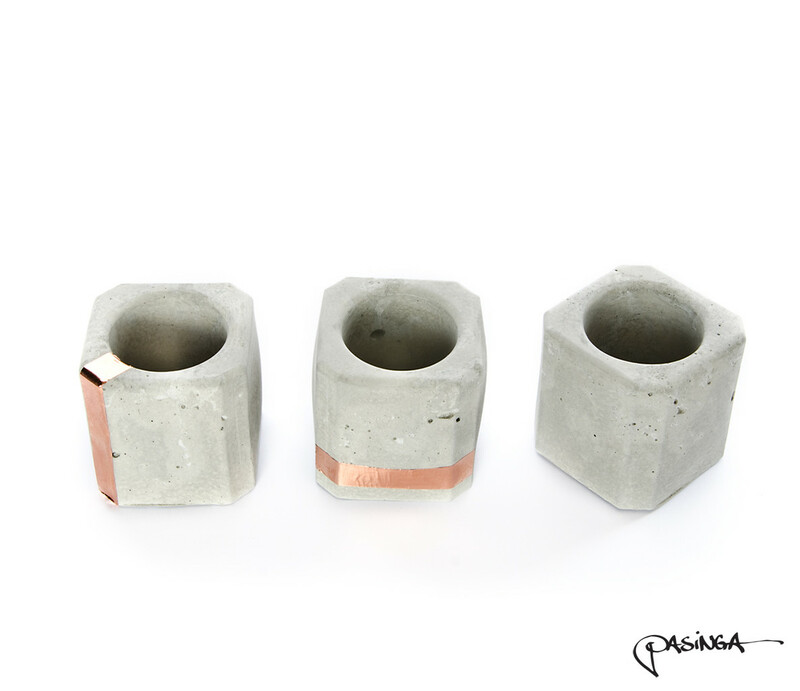 A delightful geometric concrete copper hexagon cup. It doubles as tea light candle holder or Air Plant vase. 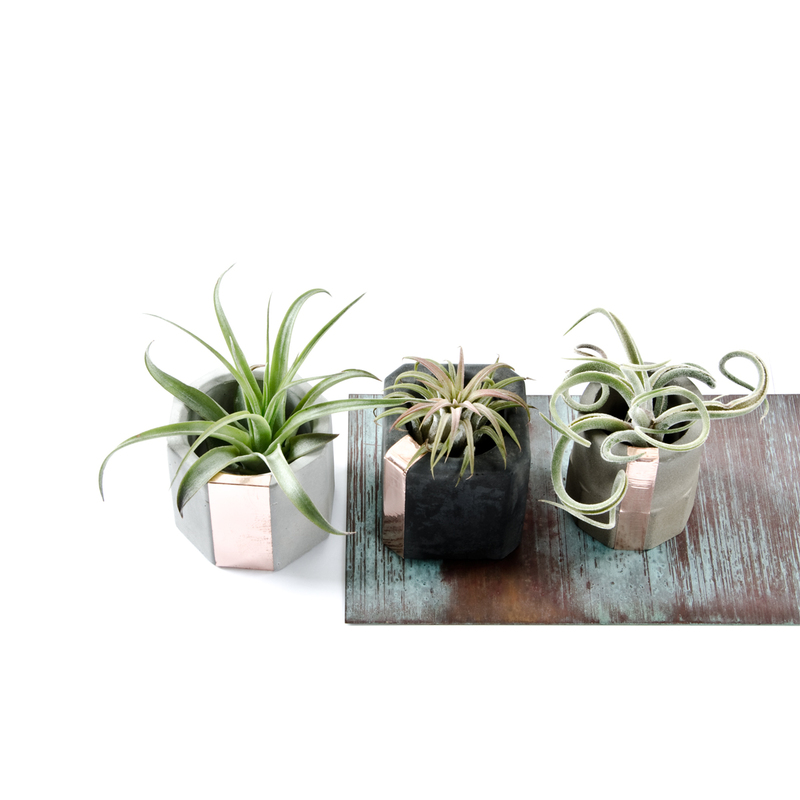 Since the living Air Plant does not need any soil you can just swap things around as often as you like and create beautiful fresh centrepieces. 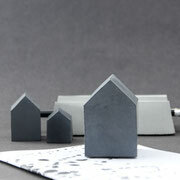 Each cup is unique as the pale grey varies and of course its inspirational imperfections and raw texture. 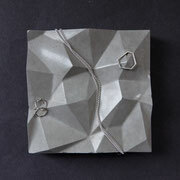 It is a wonderful birthday present, perhaps a versatile desk accessory or just a surprise to make someone smile. 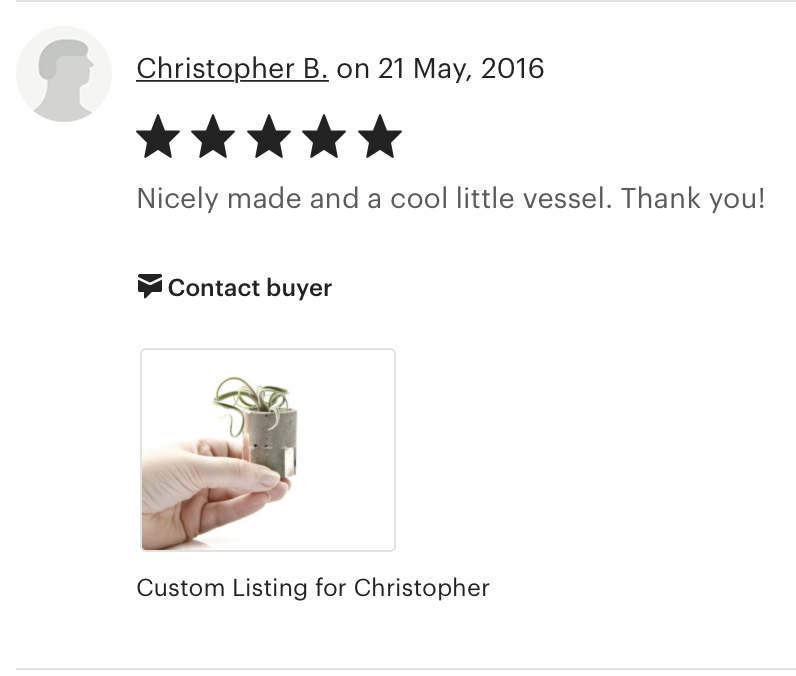 Thank you for your wonderful feedback - the last two decorated images are by fellow customers! 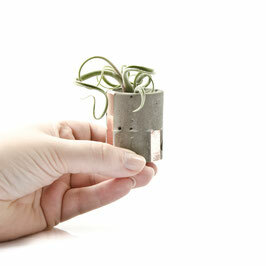 Brachycaulos Multiflora Air Plant: a medium to large plant which can grow up to 20cm tall, but its size varies greatly. The foliage is numerous, as it grows it opens up with leaves bending slightly. The leaves are green but colouring intensively red in strong sun at bloom time. 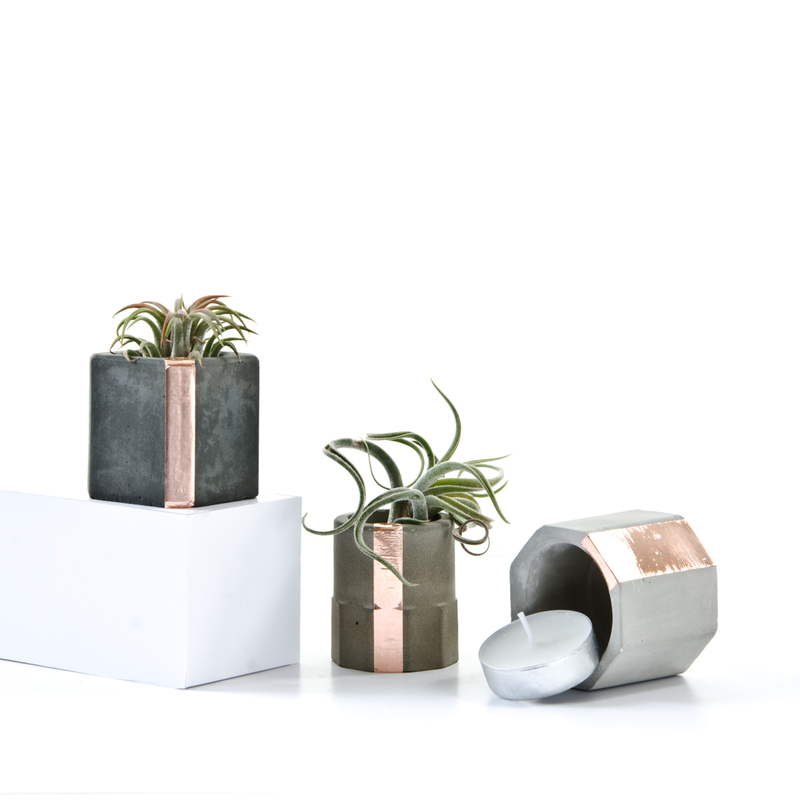 A set of 3 concrete Air Plant holders with copper and a modern accent. 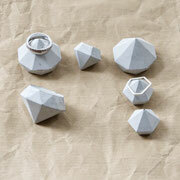 The handmade set compliments minimal decor and displays wonderful on its own on a coffee table or sideboard. 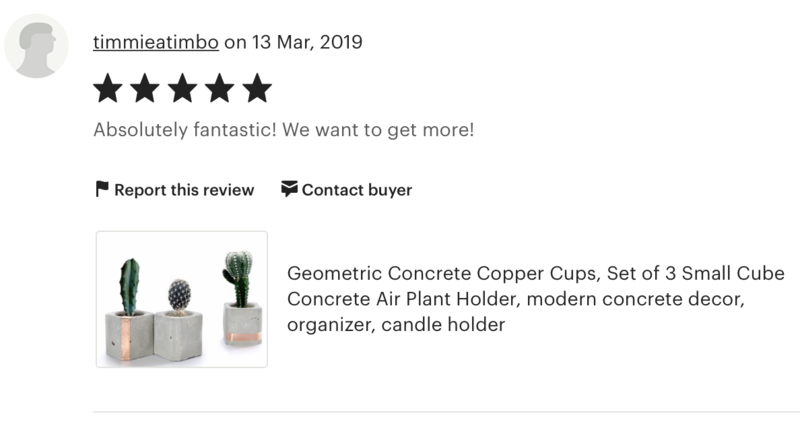 You could also utilise it as baby succulent planter, to organise your little bits and bobs or use them as a spacious candle or incense stick holder [more ideas are on my blog]. 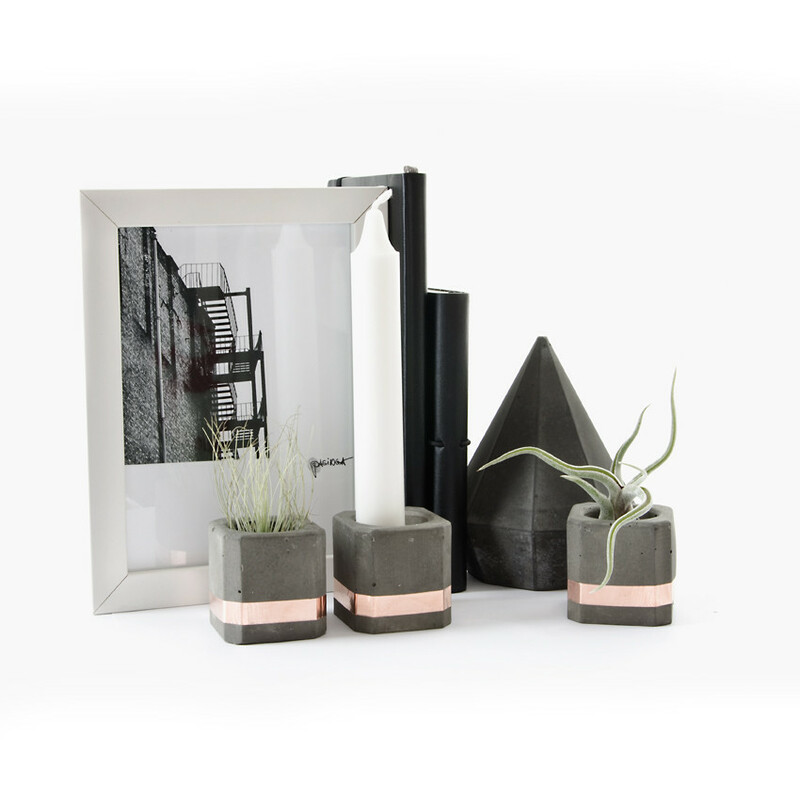 This petite set is perfect for compact living spaces, a desk accent or wonderful gift but in any case this set will keep your decor rooted in minimal contemporary charm. 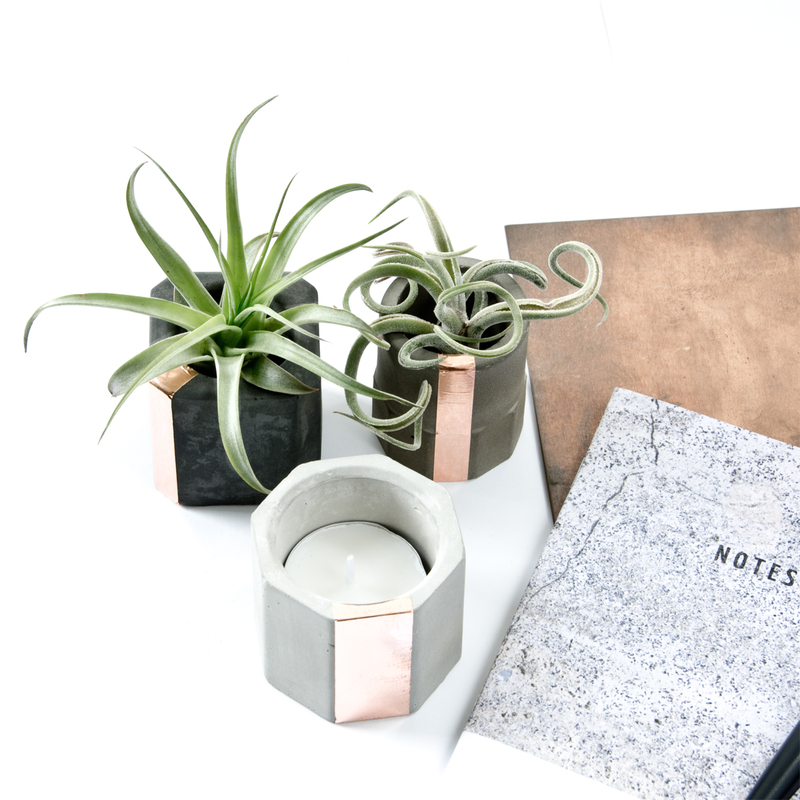 A set of three geometric concrete copper Air Plant holder cups finished with a copper loop to all three cups. 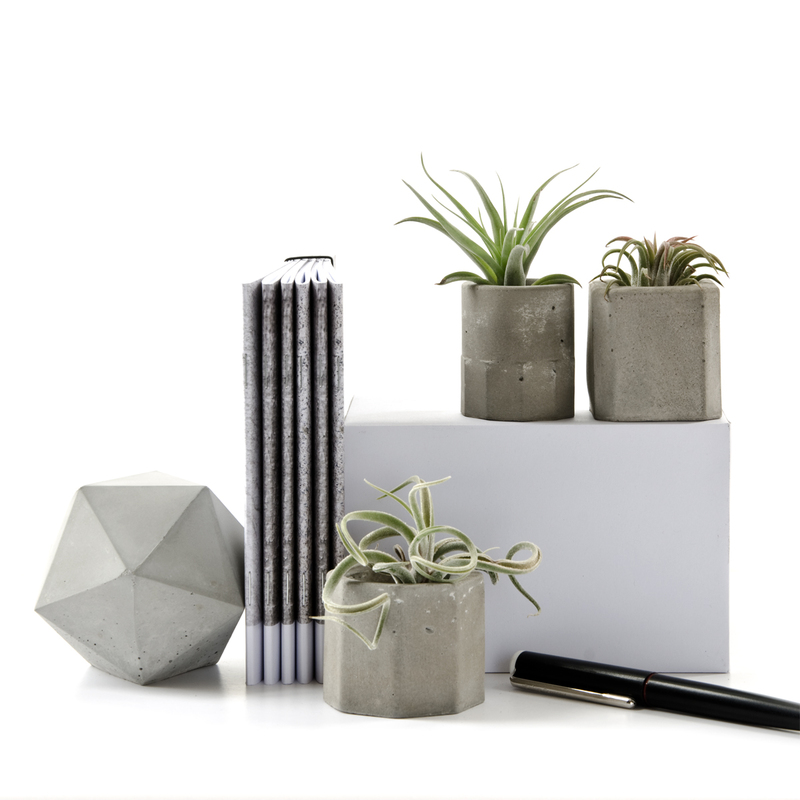 This set is a wonderful gift set to surprise with a living yet soil free plant. 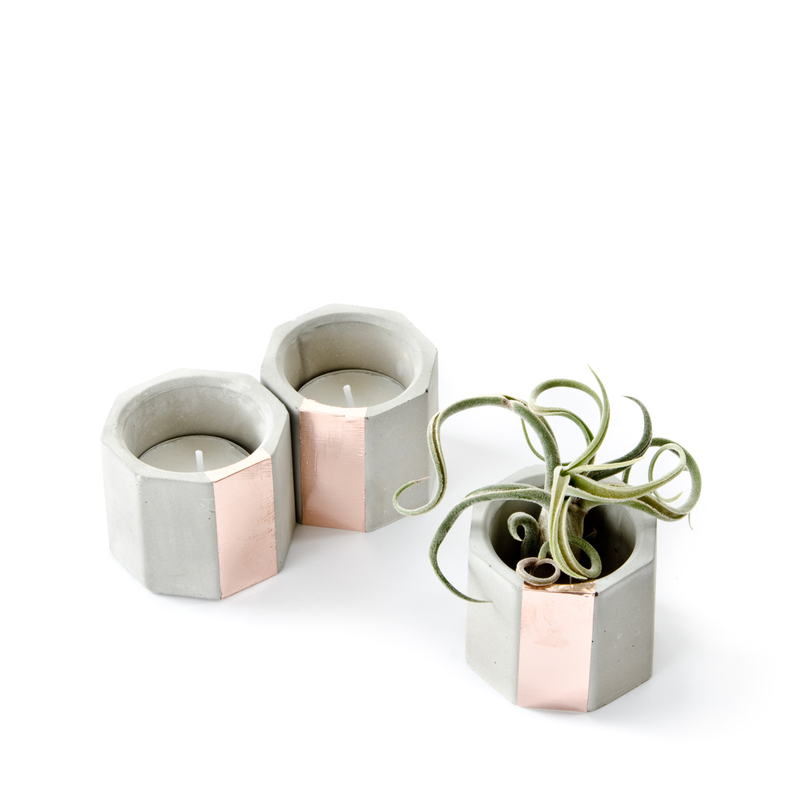 But of course you can use the cups in different ways as well. 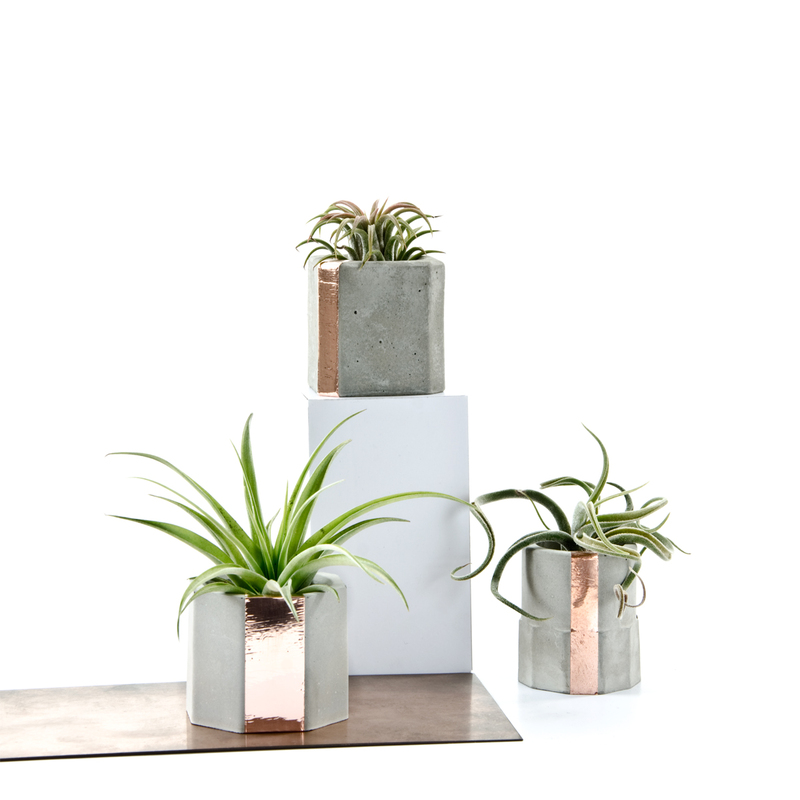 They display nicely on their own but create a wonderful centrepiece or eye-catcher when you nest the three planters together along your sideboard, desk or bookshelf. 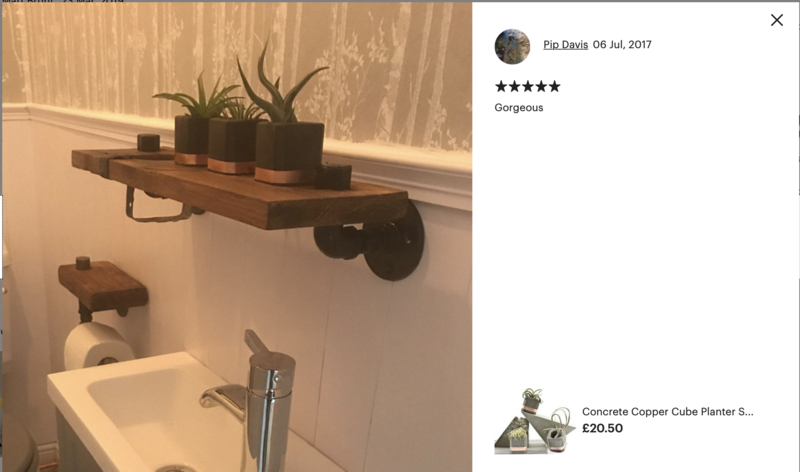 Thank you for your wonderful feedback - the last two decorated images are by a fellow customer! 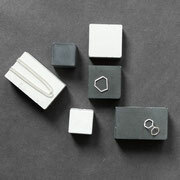 psst ... more options above and below, enjoy! Brachycaulos Multiflora: a medium to large plant which can grow up to 20cm high, but its size varies greatly. The foliage is numerous, as it grows it opens up with leaves bending slightly. The leaves are green but colouring intensively red in strong sun at bloom time. 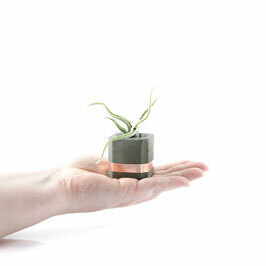 Ionantha Rubra: is very delicate and fairly small. The leaves form a dense rosette, which opens up slightly. 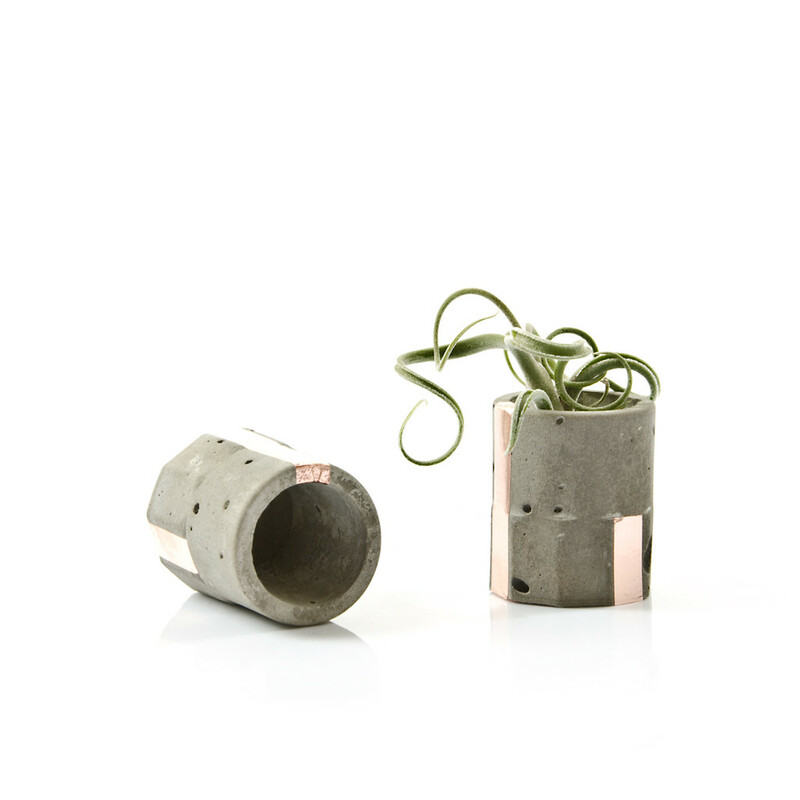 The leaves are green and turn pink at the tips. The mix it concrete copper set of three features three shapes and three finishes ranging from pale to dark grey concrete. Each has a vertical copper accent for bit of extra bliss. 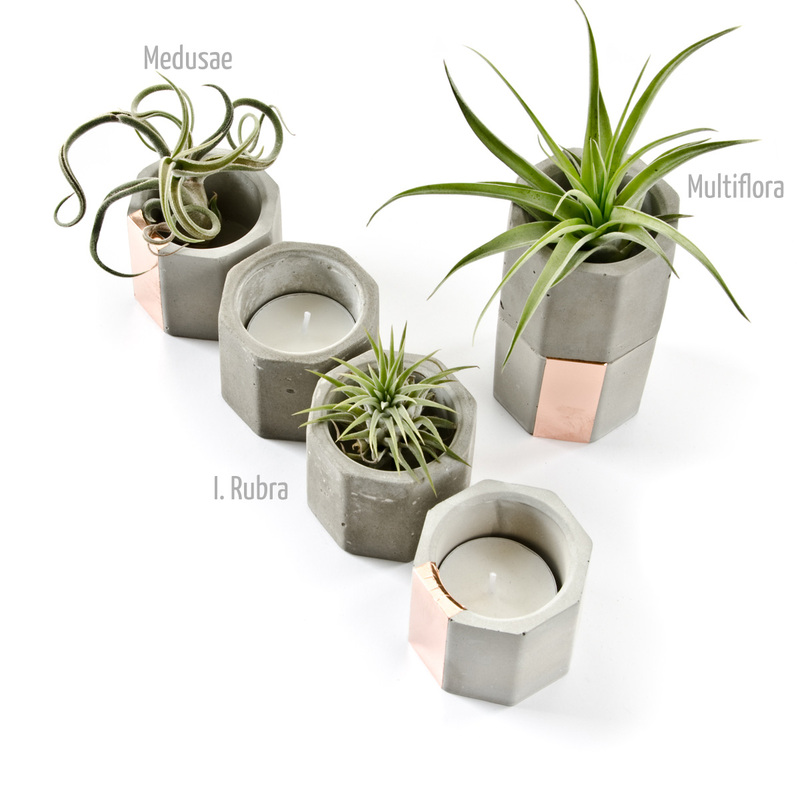 All three are perfect for Air Plants and mini succulents but the hexagon cup can also hold a tea light candle. 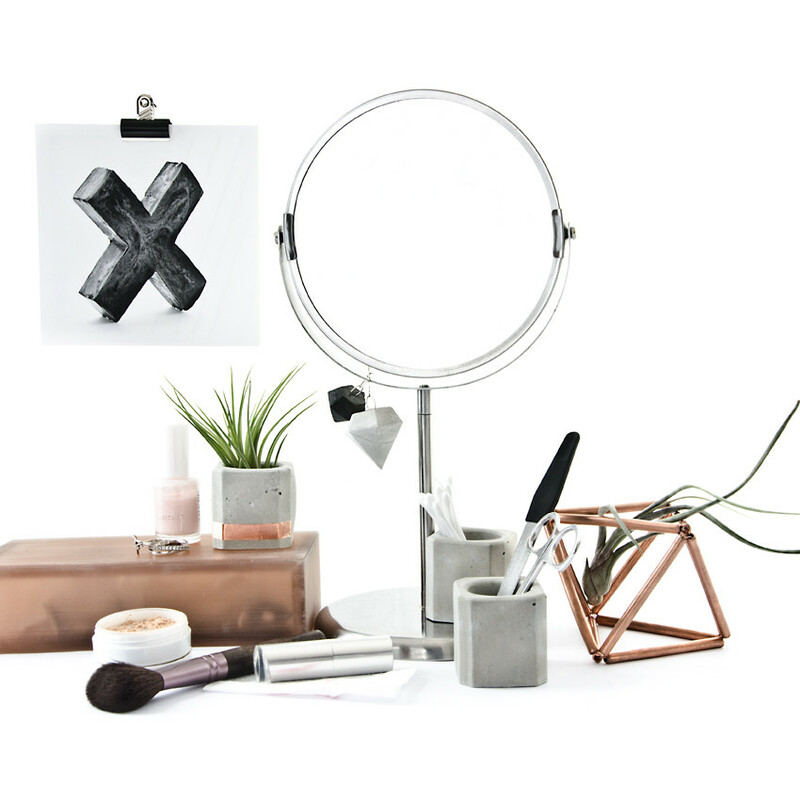 This set is wonderful as modern centrepiece but could also be an eye-catcher on your sideboard or bookshelf. 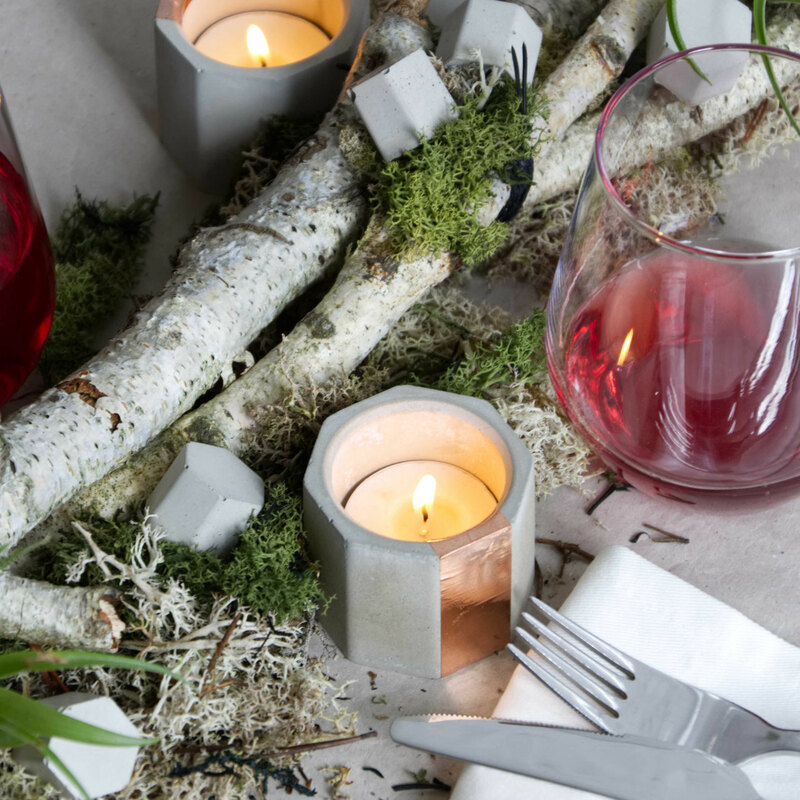 Have a look over on my blog for the tablesettings and centrepieces as well as for more inspiration. 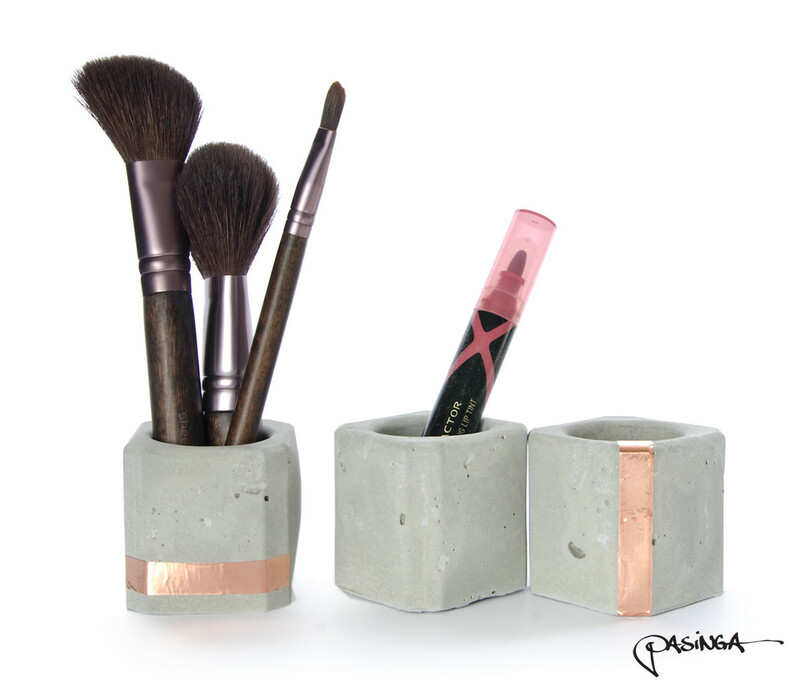 Each cup is individually hand cast and finishes with its unique shades of grey and imperfections. 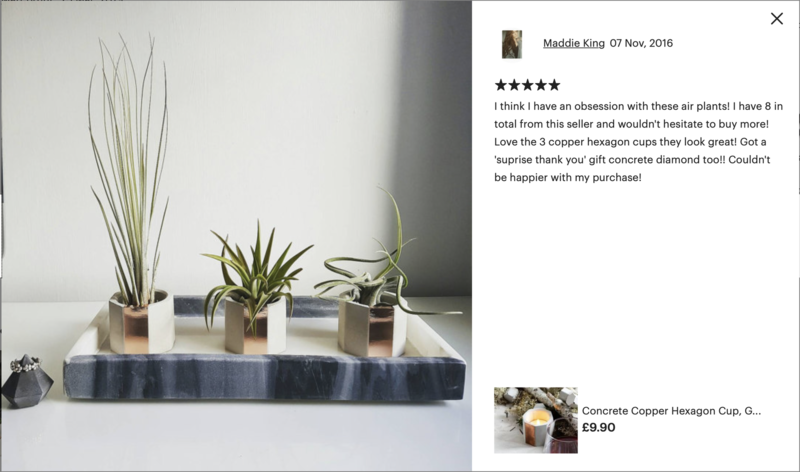 The set offers a modern almost trendy atmosphere and could make a wonderful gift for design fans or plant lovers but of course, you also could indulge yourself, I wont tell! 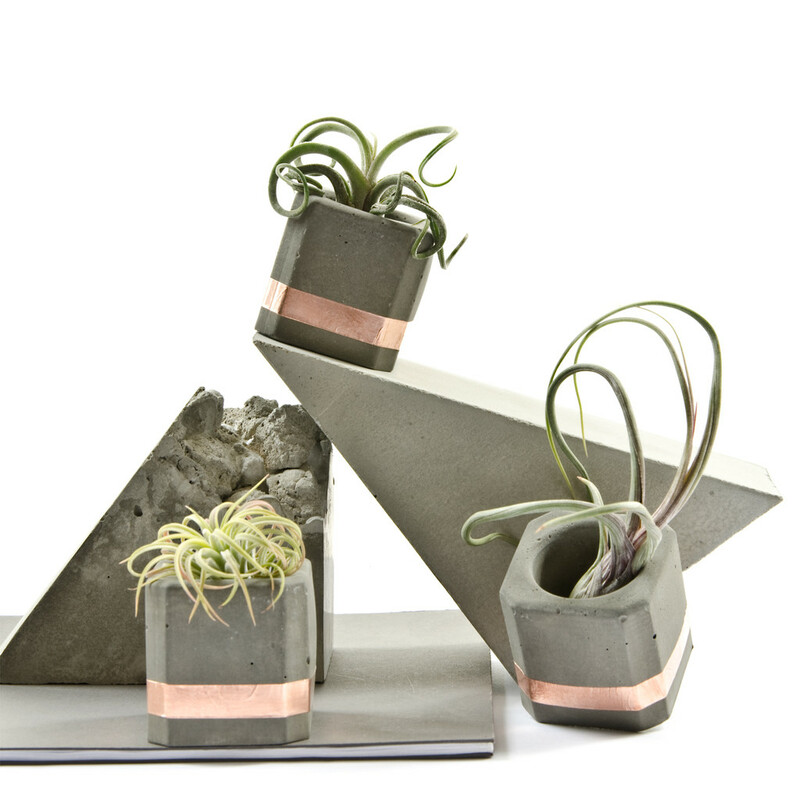 A minimal geometric spark of three concrete Air Plant holders is topped with a shiny copper accent. 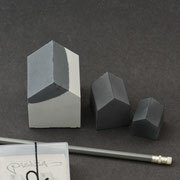 This set has a very laid back feeling and offers to be a modern accent or centrepiece. 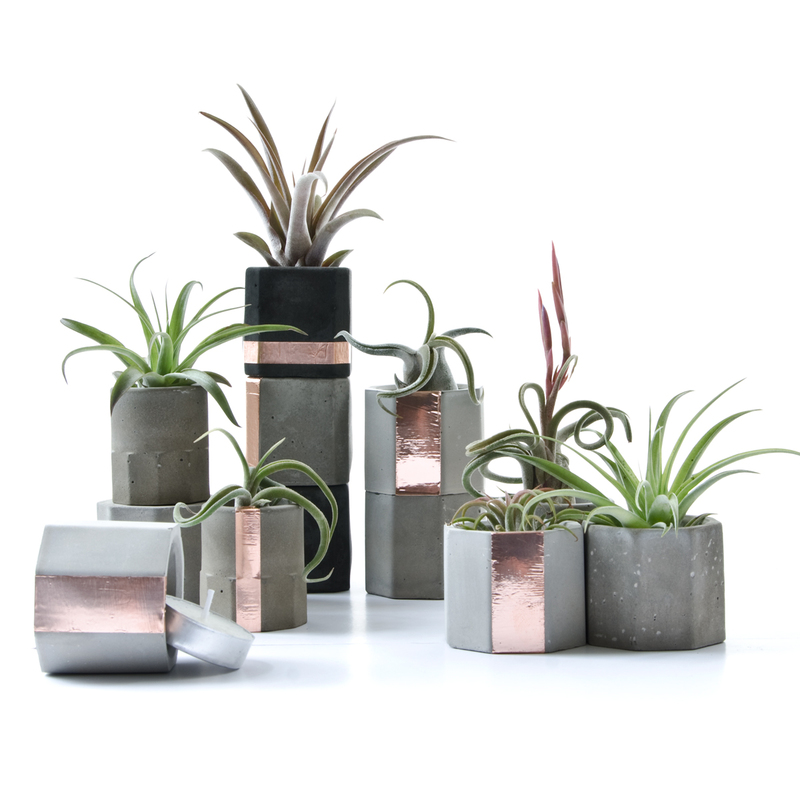 The vertical copper stripe on each vessel is the contrasting shiny colourful hint next to the soft green the Air Plants offer. The vessels are wonderful for soil free living Air Plants but the hexagon cup could also hold a tea light candle. 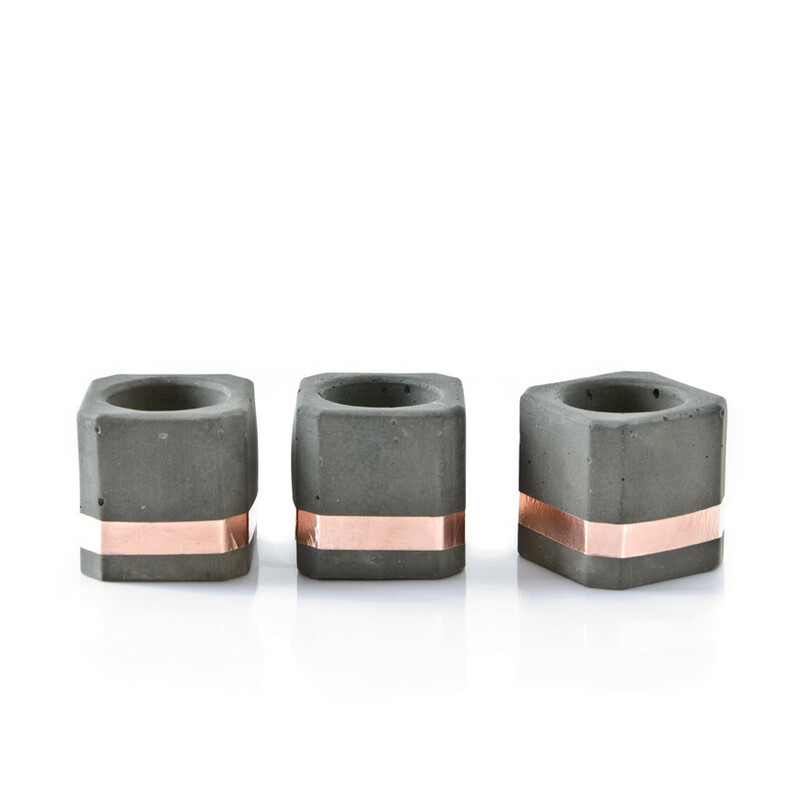 This set has proven to be a wonderful Mothers day gift as well as a birthday gift and each cup can be expected to have a unique finish due to the nature of the material. psst ... more options are above and below, enjoy!